Influenza is a highly contagious disease caused by different strains of viruses that primarily attack the respiratory system. Influenza infections, also known as the flu or grippe, typically last up to five days and produce more serious symptoms than those caused by the common cold. Scientists frequently warn of mutating flu viruses that could cause epidemics. Turmeric root is an herbal remedy used for a variety of medicinal purposes, including viral infections, because of its antimicrobial properties. Herbs may produce side effects, however, so consult your doctor before using unfamiliar herbs. Turmeric root, or Curcuma longa, has been used for countless generations in India as a clothing dye, food spice and medicinal herb within Ayurvedic medicine. Turmeric root is typically dried and ground into its characteristic yellow-orange powder. It can be added to water to make a natural dye or used for seasoning Asian-type foods, especially curry dishes. The biologically active or medicinal compound in turmeric powder is curcumin, which has numerous purported health benefits, according to "The Way of Ayurvedic Herbs: A Contemporary Introduction and Useful Manual for the World's Oldest Healing System." According to "Medical Herbalism: The Science Principles and Practices of Herbal Medicine," curcumin displays powerful antioxidant, antimicrobial and anti-inflammatory properties. 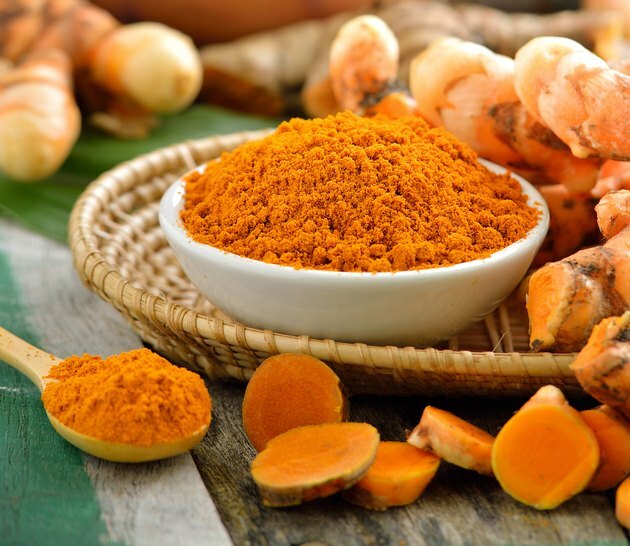 Curcumin activates a gene that encodes for the synthesis of antioxidant proteins, which can protect against the deterioration of dementias, such as Alzheimer's disease, and the damage caused by viral infections. A study published in a 2003 edition of the "Italian Journal of Biochemistry" found that curcumin activates the gene hemeoxygenase-1 within the hippocampus of the brain, which causes the production of bilirubin, a powerful antioxidant. Curcumin also has its own antioxidant abilities and scavenges free radicals, which enhances the body's immune system and better enables it to handle infections. Curcumin also possesses strong antiviral properties that have a direct effect on influenza infections, or their prevention. According to a study published in a 2009 edition of "Emerging Infectious Diseases," curcumin can reduce viral replication by over 90 percent in laboratory cells infected with influenza varieties. Curcumin decreased viral replication in infected cells, but also seemed to protect other cells from becoming infected. The researchers suggest that curcumin-rich turmeric is a viable candidate for treating influenza naturally, as it can interfere with the replication process in viruses and other microbes. Turmeric powder can be taken preventively or during an influenza infection. As a preventive health supplement, turmeric is often taken in capsules with dosages ranging from 250 to 500 mg daily. For cooking, turmeric powder can be added for flavor and spice in larger amounts as it is completely nontoxic, according to "The Essential Book of Herbal Medicine." During an influenza infection, a teaspoon of turmeric powder can be mixed in a cup of warm milk and taken three times daily. Are There Herbal Alternatives to Amoxicilin?